What happens when you take the most outrageous piece of classical music of the 20th century, and perform it in a giant, reverberant hall in front of thousands of unsuspecting tourists in an art museum at the heart of the United States' capital, using an orchestra made up entirely of robots? Maybe that's not a question you ask very often, but nevertheless I got to answer it last spring, when the National Gallery of Art asked me to put together an all-mechanical version of George Antheil's notorious Ballet Mécanique. 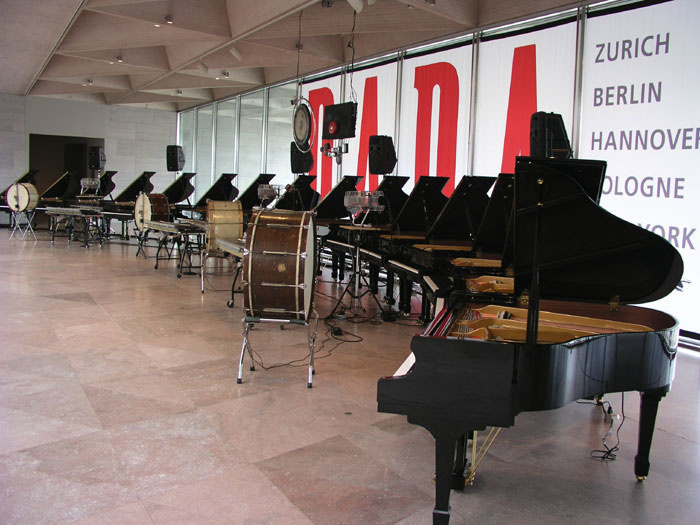 The robot orchestra in place on the mezzanine level at the National Gallery of Art, Washington DC. Many SOS readers will remember my struggles with this wild piece, which were detailed in the August and September 2000 issues and the September 2002 issue. But what the Gallery wanted went several steps beyond anything I had done before. The National Gallery is one of the largest art museums in America, occupying two enormous buildings on the National Mall in Washington DC. 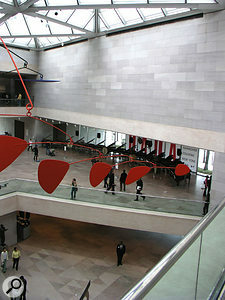 The East Wing building, designed by architect IM Pei in the '70s, is a glass and granite behemoth, with an interior atrium four storeysstories high, surrounded by gallery spaces, along with a café, a gift shop, an auditorium and a library. In one of those galleries, from February to May of this year, resided the largest exhibiton of Dadaist art ever put together. Dada was the 'anti-art' movement of the 1910s and '20s, and involved some of the most original and revolutionary thinking in the history of art. Just about every major artistic movement since, including pop art, surrealism, abstract expressionism and post-modernism, owes a major debt to Dada. 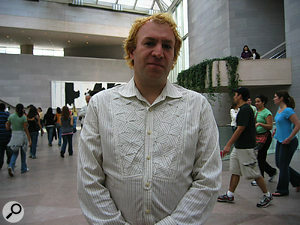 The head of the Gallery's music department, Stephen Ackert, is himself a keyboardist. His job normally is to produce concerts in the Gallery's auditorium that relate to the art on display, and he is responsible for upwards of 60 musical events every year. But for Dada, he wanted to do something different. Ballet Mécanique, even though it was written in the waning days of the movement, can be thought of as exemplifying Dadaist principles perhaps better than any other music of the time: it has no apparent structure, it smashes disparate elements together without rhyme or reason, it copies gleefully and unashamedly from many sources, and it leaves the listener confused, exhilarated and exhausted. A concert of Ballet Mécanique could only be one-time event, Ackert knew, but was there an alternative that would get the Ballet Mécanique to live in the museum, the way paintings and sculpture do? That was the question he posed at our first meeting in October, 2005. And I immediately came up with an answer: robots. As it happened, the previous May I had met Eric Singer, director of the League of Electronic Musical Urban Robots (LEMUR), at the New Interfaces for Musical Expression conference (which I wrote about in last January's SOS), and I knew that he would be the man to call. I put Eric and Stephen in touch with each other, and we all worked out a plan. What we ended up creating turned the National Gallery on its ear, and exceeded all of our expectations. 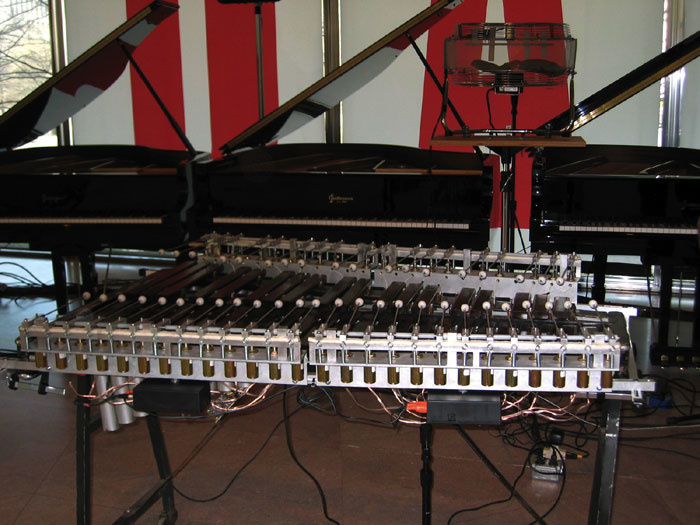 The first thing you need to play Ballet Mécanique is a lot of MIDI-driven pianos. The piece can be done with as few as four, but it's much more fun with 16. 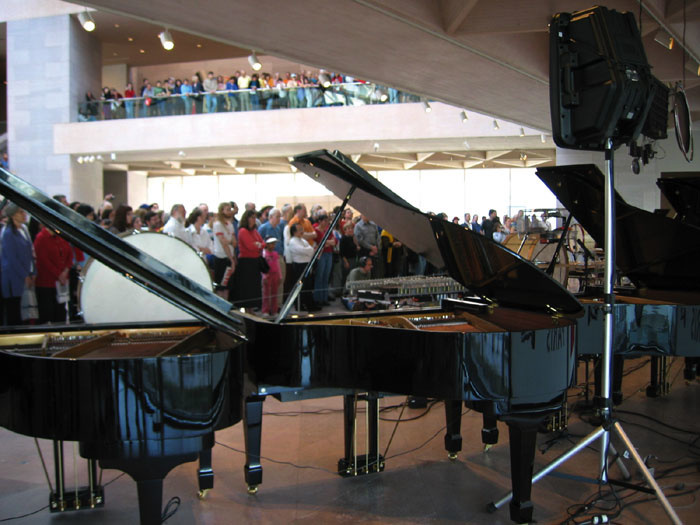 Before I came on board, the Gallery had begun negotiations with Yamaha, who had supplied Disklaviers — uprights, electronic 'digital grands', and on one occasion a handful of acoustic grands — for most of the previous performances. But when it came time to commit to the Gallery project, the company decided not to participate. Eric Singer, Director of the League of Electronic Musical Urban Robots.Photo: Charles Amirkhanian / Other MindsFortunately, there was a Plan B: during my initial research on the Ballet Mécanique, I found that pianos equipped with QRS Music's 'Pianomation' system were also capable of playing the complex score. So I contacted that company, pretty much cold-calling the president, and his response was astounding: they would be happy to oblige, and would it be OK if they gave me 16 grand pianos? Well, sure! They even agreed to send a 17th piano to me so I could work with it at home, to make sure my sequences would play correctly. QRS make a number of different brands, and the pianos we got were Gulbransens. Made in China, they are very respectable instruments, and are a lot more affordable than the Yamaha Disklaviers. But there are some sacrifices, one of them being that the four lowest and four highest notes on the keyboard cannot be played with MIDI. The company explained that this was a cost-cutting measure, since most standard piano literature didn't use those notes very much. So part of my job was to modify the files (in Digital Performer, my current sequencer of choice) to bring the passages with those notes — primarily percussive clusters and fast glissandos — into line with what the pianos could do. Given the atonal, anarchic nature of the piece, I doubt anybody else noticed the change. A more pleasant surprise was discovering that the key mechanisms in the Gulbransen pianos have a slightly shorter recovery time after playing a note than the acoustic Disklaviers. This meant I could play the piece faster. Repeated notes and chords are an important feature of the piece: it ends, in fact, with a dissonant, complex 16th-note chord repeated 302 times. Antheil's proposed tempo for the piece was of the order of 150bpm, but no-one, man or machine, can play it that fast. The fastest a human ensemble has ever been able to play it is 120bpm, and I was able to get an ensemble using Disklaviers, plus sequenced percussion samples, to play it at 133bpm before the pianos started dropping notes. 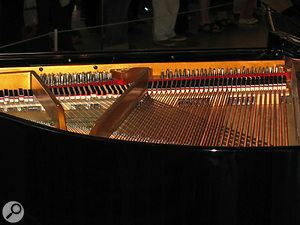 But the Gulbransen pianos, with their faster recovery, could play the piece at 138bpm. 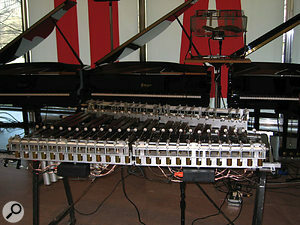 The 'robot xylophones' built by Singer, with a separate beater for each key. Photo: Charles Amirkhanian / Other MindsIn general, the Gulbransens' response to MIDI data is similar to the Yamahas', so customising the MIDI files for the new instruments wasn't difficult. They have, for example, the same 500-millisecond delayed response to external MIDI commands. Fortunately, though, that delay is not extended to the instrument's MIDI Thru jack, which it is on the Disklaviers. That meant I could daisy-chain each group of pianos, making the wiring much easier than when using Disklaviers, for which I had to set up four Thru boxes and star networks. Four days before the opening of the installation, after closing time at the Gallery, a five-man crew from QRS and two 18-wheel tractor-trailers arrived, and over the next 12 hours unloaded, set up, tested and tuned 16 black grand player pianos on the mezzanine. With their lids propped open, it looked from the street, as the Washington Post put it, "like a line of folding-wing World War II fighter planes, arrayed on the deck of a landlocked aircraft carrier". As for the two 'human'-played piano parts, I merged them into the player-piano tracks, since dedicating two of the Gulbransen instruments to them would have thrown off the balance of the piece. We also used two Kurzweil Micro Piano modules, wired through JBL Eon powered speakers (the Gallery had a whole lot of these, which were to prove very useful) to provide some reinforcement. Ballet Mécanique was the creation of a brash young American composer in Paris named George Antheil in 1924. It called for two pianists, three xylophones, four bass drums, a tam-tam, a siren, seven or so electric bells, three aeroplane propellors, and 16 synchronised player pianos. Since the technology to sync mechanical player pianos didn't exist at the time, Antheil never heard the piece the way he intended it. Before it could be played, he had to reduce the number of player pianos to one, but even with this smaller ensemble the piece was a huge hit, causing fistfights in the concert hall and riots in the streets at its premiere. In the peculiar artistic milieu that was Paris in the '20s, this made him a superstar. His efforts to bring the piece to America, however, were a colossal failure, and after that it was not heard again for over 60 years. Antheil's fame took a nosedive too, and although he later had a reasonably successful career as a Hollywood film composer, his reputation never recovered. In 1998, I was contacted by G. Schirmer, who had acquired the rights to Antheil's music, and asked to create MIDI files of the player-piano parts from the original score, which could then be played on modern MIDI-controlled player pianos. I also recorded samples of the various noisemakers, and produced the first performance of the piece, at a college in Massachusetts, with a student percussion ensemble and 16 Yamaha Disklaviers. We produced a CD of that concert, and since then the piece has been performed some two dozen times, by such groups as the San Francisco Symphony and the London Sinfonietta, who took it on tour around the UK and Europe as part of their Warp series, alongside Squarepusher and Supercollider's Jamie Lidell. I also was asked to edit the piece so that it could accompany an abstract film of the same name by French artist Fernand Léger and American cinematographer Dudley Murphy. The music originally was supposed to be the score for the film, but due to the technical limitations of the era, the two couldn't be presented together. The newly realised score and film did a five-year world tour as part of a massive 19-part programme of early avant garde film called 'Unseen Cinema', which was released late in 2005 as a seven-DVD box set (www.unseen-cinema.com). Besides the player pianos, the most complex parts in the Ballet Mécanique are for xylophones. Although the parts are written for three instruments, it's actually impossible for fewer than four players to cover everything, and some performances have even used five. 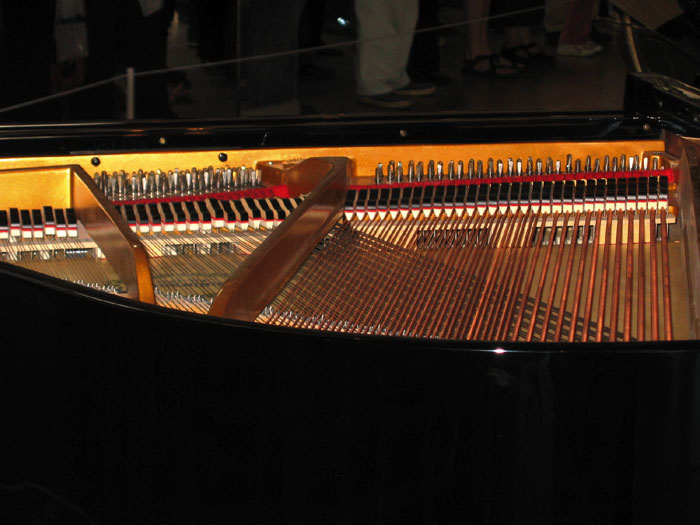 Even then, the parts require a ferocious technique, incorporating chromatic glissandos, parallel major sevenths, and other inhuman feats. They are so hard, in fact, that some musicologists believe Antheil may have intended them to be played by mechanical xylophone players, although the piece was never performed that way. Well, now it would be. A closer view of the orchestra, with its 16 Gulbransen grand pianos equipped with QRS Pianomation. Photo: Charles Amirkhanian / Other MindsEric Singer and his team had designed, for some earlier LEMUR projects, a device they called the 'Beater Bot': a custom, microprocessor-controlled, solenoid-and-lever mechanism used to hit a beater at high velocity against a surface. Each individual mechanism can be programmed to respond to a unique MIDI note, and the microprocessor also maps the velocity of each incoming note to the specific mechanism's gate time: within a small range, longer contact time with the surface results in a louder note, which allows for programmable dynamics. The Gallery arranged to rent all the necessary percussion instruments, which were delivered to Singer's workshop in an industrial section of Brooklyn, New York. Singer and his team had to work on a very tight schedule, and their first idea was to use a small number of beaters on the xylophones which could move around to play different notes. But they quickly realised that it wouldn't be fast enough for the piece, so they decided to use a separate beater for each key — 44 per instrument. 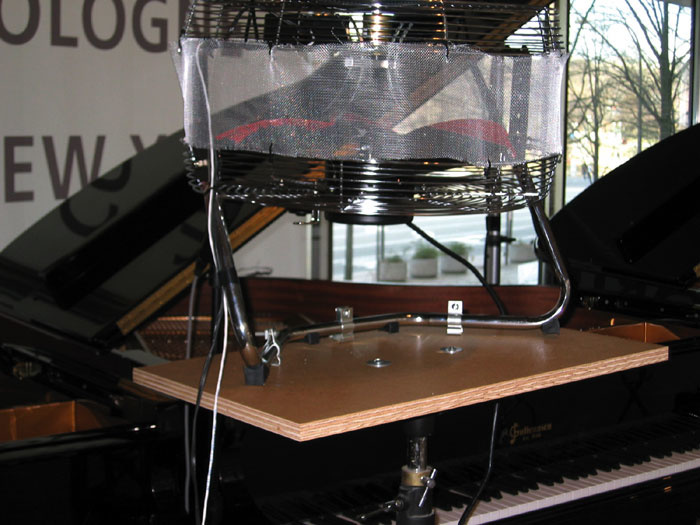 To allow the mechanisms to be mounted underneath the xylophone keys (giving the audience a better view of the beaters themselves), they were designed so that the solenoids pulled down on the beater rods. At the business end of the rods, the team put three-quarter-inch Delrin balls, which they found produced the best tone without damaging the keys. 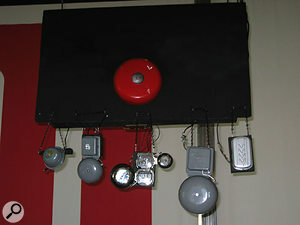 The bass drums and tam-tam were much simpler to deal with: a Beater Bot was mounted on a crossbar bracket attached to each drum rim and the tam-tam stand, and fitted with a rubber ball, which the group found offered the best combination of tone production and quick recovery (the percussion parts are fast, too). In past performances, the siren part had been played using a looped sample or by a performer on stage with an old-fashioned hand-cranked siren. We wanted to avoid using samples, so Eric came up with a small 110-Volt siren that packed a tremendous punch. Although only about four inches in diameter, at full blast it easily overwhelmed the rest of the ensemble, so we covered some its air holes with duct tape and mounted it underneath one of the piano keyboards. The siren's pitch was dependent on the incoming voltage, and it responded quickly to voltage changes, which gave us a lot of control over its sound. We bought a Mediamation LM4 MIDI light dimmer, and assigned MIDI Controller 1 to one of its AC outlets, into which we plugged the siren. Now we could program modulation-wheel changes into the sequence, and the siren would follow them as it wailed up and down. One of the MIDI grand pianos in action.Photo: Charles Amirkhanian / Other MindsFor the bells, we used the MIDI-controlled 'Bell Box' I had built some years ago for the initial performances, at the heart of which is a MIDI Solutions R8 relay array. Since the seven electric bells draw a lot of current, the relays trigger a second array of high-current relays fed by two hefty DC power supplies. We had had some trouble in the past with the power supplies overloading and shutting down, and since there was going to be no one around to fix anything once the installation was up, we wanted to avoid that. Eric replaced the two supplies with individual transformers on each bell, figuring that the bells would run just as well on AC as DC, and that getting rid of the rectifiers and regulators would make things simpler and more reliable. He was right: they performed without a hitch.The propellors posed the most interesting design problem. In Antheil's day, the sound was simulated by electric fans into which leather straps or wooden sticks were inserted on cue. One performance in Germany in 2002 used that idea, but otherwise all modern performances have used samples of airplane engines that a friend of mine recorded, which are provided on a CD-ROM along with the sequence files to any performing group that rents the music from the publisher. The 'Bell Box' was recycled from previous performances of the Ballet Mecanique.For the National Gallery installation, we decided to do it the old-fashioned way: we bought three 18-inch industrial fans, and mounted them so that they pointed straight up. Eric attached a solenoid mechanism to each fan's frame, and put a metal crossbar at the end of the solenoid's shaft, which would get pulled down when the solenoid was energised. Attached to this crossbar were four strips of one-inch-wide industrial nylon which would then be pulled into the spinning blades of the fans. The effect was gloriously raucous, even more so after we placed a Shure SM57 microphone underneath each fan and ran it through a JBL Eon speaker directly behind the contraption. We knew that this device would require maintenance, since the nylon would wear down, so Eric put little clamps on the crossbars to make it easy for Gallery personnel to replace the strips. He also covered the fans with window screening so that little bits of nylon wouldn't go flying out into the crowd! A side-effect of using the microphones, however, was that the sound of the spinning fans was now amplified, even when they weren't playing the propellor cues. A partial solution was to plug the fan motors into the remaining outlets on the Mediamation LM4 light dimmer, and then have the sequencer turn them on and off with controller commands. But before each propellor cue, the fans needed about five seconds of warm-up time, and we felt that the amplified sound of them spinning up would have spoiled some of the dramatic impact of the propellors. Fortunately, we came up with a solution. During the early planning stages, I had contacted Mark Of The Unicorn about loaning the Gallery some of their products, and I had the foresight to request not only a MIDI Timepiece USB, but also an 828 MkII digital audio interface, even though I wasn't sure what I might use it for. Well, I knew now: we ran the microphone lines from the fan through the 828, and then out to the speakers, and I created a 'live' audio track for each microphone, inserting mutes on the tracks at the points where we didn't want the fans to be heard. The only thing left to do, once we got our Frankensteinish band up and running, was to make a recording of it. The Gallery has an in-house videographer, Karl Parker, and he shot a couple of the first performances, getting plenty of audience reaction as well as the robotic instruments. National Public Radio had a recordist come by on opening day for a feature story that was broadcast a few weeks later. But we wanted something more definitive. One of the major private financial supporters of the Dada exhibit was a local businessman who is also a video buff, and he produces a programme on the arts for a cable-access TV network. So one night after the Gallery closed, he and two other cameramen, along with Parker, Gallery audio director John Conway and myself, came in and recorded the piece. We played it three times, with the cameras at a different distance for each take, so that we had 12 almost perfectly synchronised angles, which I was able to edit later in Final Cut Pro. I also brought to the session MIDI files for a 16-minute version of the piece at the new tempo (which I thought some day I might want to use with the film) and for the entire score, uncut. We recorded those as well. What made the recording especially interesting was that I had an opportunity to use a Soundfield Mark V microphone system, which was loaned by the American distributor, Trans Audio. This system (reviewed in Sound On Sound in September 2004) uses a single microphone to record four separate signals, which can be decoded after the fact to provide mono, stereo, M+S stereo, surround, or surround with height. There is nothing like it for placing a sound within an acoustic enviroment, and it did an amazing job of capturing the voluminous Gallery interior, which has a reverb time measuring six seconds. The system includes a processor/preamp with outputs for the four B-format signals, and also a stereo output pair. We recorded all six outputs. In addition, Conway set up a Neumann USM69 stereo mic, set to an X-Y pattern, right in front of the ensemble, and a pair of Schoeps CMC 5Us, with MK1 capsules set to omni, at the left and right ends, all going through a Millennia Media four-channel preamp. The audio was recorded using Digital Performer and Mark Of The Unicorn and M-Audio interfaces, at 48kHz/24-bit. It was the first time I got to try out OS 10.4's ability to address multiple audio interfaces, and it worked flawlessly. I haven't yet tried to mix the recordings in surround, but for the stereo mix I made to accompany the video (available on www.antheil.org), I used about equal parts of the Soundfield's stereo output and the Schoeps'. I realised early on that cabling might be an issue. 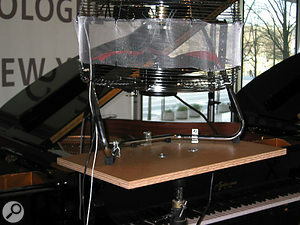 The entire orchestra was to be controlled from a Macintosh G5 computer provided by the Gallery, placed discreetly in a cabinet off to one side, with the result that the distance from the computer to the last piano was some 75 feet. The Bell Box and the tam-tam were suspended from the ceiling, and sending cables to them so that they wouldn't be obvious to the audience meant snaking them through a 100-foot-long path. MIDI cables can't run that far — or can they? The sound of an aeroplane propellor was mimicked by having strips of nylon hitting an industrial fan.Photo: Charles Amirkhanian / Other MindsI proposed to Eric that we use MIDI Thru boxes throughout, to keep cable runs short, or put the MIDI Timepiece in the middle of the instruments and run a long USB cable back to the Mac. For the bells and tam-tam, I suggested using a wireless MIDI system, and I even got the Canadian manufacturer Classic Organ Works to lend us one of their impressive MIDIJet Pro systems. But Eric vetoed all these ideas, saying that he had done longer runs at past LEMUR installations, and they were not a problem as long as the cables were good — certainly, they would be more reliable than extra-long USB cables. We bought a couple of reels of high-quality, shielded, balanced audio cable and some heavy-duty MIDI jacks, and rolled our own. Once again, his experience paid off, and there were no problems. While Eric and his team slaved over their lathes and arc welders, my biggest task in the weeks before the opening was to make the Ballet Mécanique shorter. As recorded, the piece is 31 minutes long, and even at the frantic tempo the machinery now allowed us to take, it was still about 22 minutes. Stephen Ackert wanted each performance to be no more than 10 minutes, since he was worried about the attention span of the audience. The National Gallery is a free museum, and thousands of visitors — mostly tourists — pass through every day. There were no chairs in front of the installation, and only a small sign announcing the performance schedule (at 1pm every day, with a second performance at 4pm on weekdays), so this was a far cry from a typical concert venue. People could wander off at will, and if they got bored, they would. The regular performances began to attract large crowds to the Gallery.Photo: Charles Amirkhanian / Other MindsFurthermore, Stephen wanted to maintain as much as possible the ghostly silences towards the end of the piece, since they do such a good job of keeping the audience off balance (Is it over? Should we clap now? ), which was a major goal of Dada. I had already cut the piece down to 16 minutes to accommodate the Léger/Murphy film (see the 'Mechanical Magic' box), but in that edit I had taken out all the silences, so if I wanted to put them back in, I was going to have to start again. Although I grumbled a bit, the cutting wasn't too painful, and we ended up with a very tight, suspenseful 10-minute piece. After watching the audience reaction a couple of times, I saw that Stephen's decisions — both to keep it short and to keep the silences — were absolutely correct. And speaking of the audience, they loved it. During the first week of performances, there would typically be a couple of hundred curious listeners, most of whom looked as though they just happened to be strolling by, but soon word got around, and by the second week thousands were coming in on their lunch hour, crowding the floor of the mezzanine and the four balconies above it, to witness what someone referred to as "the world's biggest and loudest music box". The looks on their faces were very gratifying to see: some just stood with their mouths open (and sometimes their ears covered), some peered intently at the instruments, trying to figure out what was going on, some nodded along, although without much success, to the rhythm, and some just laughed for the whole 10 minutes — all of which were perfectly appropriate responses. The Gallery had originally planned to keep the installation going for only 17 days, but after they saw what kind of reception it was getting from the public, they extended it another seven weeks. Eight decades after its creation, the Ballet Mécanique continues to amaze and confound listeners, and it also continues to surprise me with the new challenges it poses.